Counting has never been so much fun! 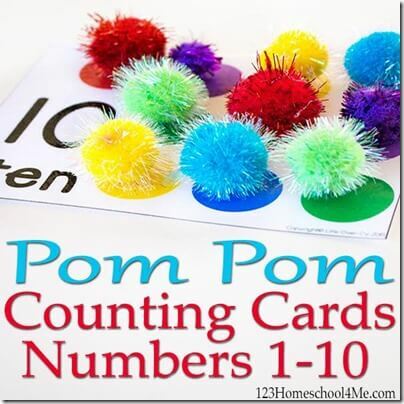 Teaching your toddler, preschool, and kindergarten one to one correspondence, color matching, and more while learning to count 1 – 10 with these free Counting to 10 Pom Pom Cards. 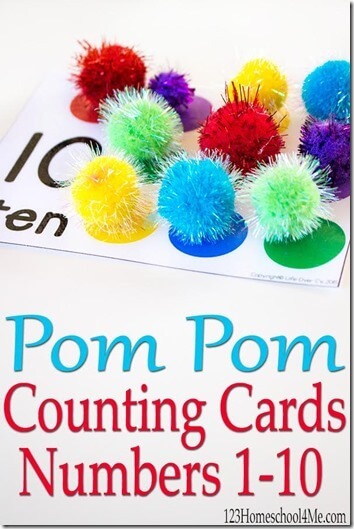 I’m so excited to share these Free Printable Pom Pom Counting Cards! We have been having a blast with several different counting cards and it is so fun to change up the different themes depending on what we are working on at the moment. Pom Poms are a common craft supply that many people have on hand, if you don’t have pom poms, you can substitute 10 of any object. 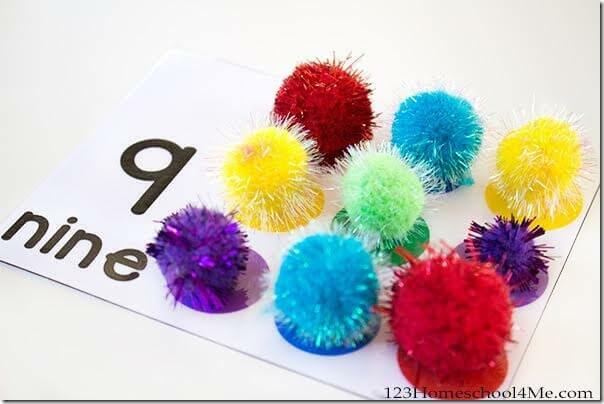 Have your child cover the circles on the counting cards with the correct number of pom poms. We used “spiky” pom poms for more sensory input as we were working. If you have a child that would be bothered by that, just stick with the traditional soft pom poms. These cards are perfect to new learners who are not ready for independent counting. The kids simply cover each circle on the card as they are counting. That way they know when to stop for each number. When children first start counting they need to learn one-to-one correspondence. That means for every number that we count, it actually represents one object. This can be a different thing to understand, so providing something for them to match up helps them know they are finished with the task on the card. For very beginning learners, I recommend only using numbers 1-3 and reviewing until they are solid with those numbers. Then move onto 5, 8, and finally 10. For an additional challenge, you can have your child match the colors of the circles to the pom poms or you can just focus on counting. For language development, repeating “put the [red] pom pom on the circle”. 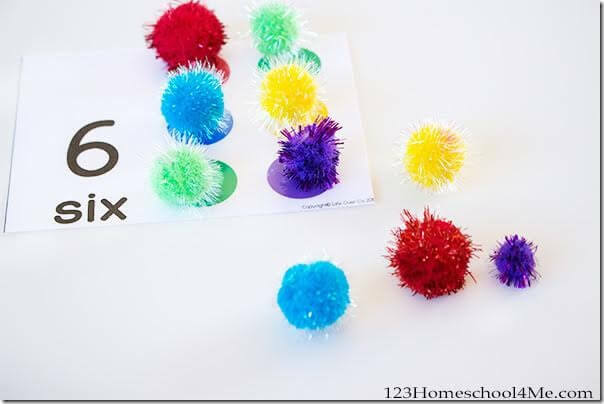 This will help kids to understand that they are all pom poms, but each color has its own name.